Round five is in the bag and both sides are bracing for what could only come next in the battle between the South Korean government and the "big three" conservative newspapers. With a combination of jabs, uppercuts, and below the belt shots, round one went to the daily vernacular conservative papers — Chosun Ilbo, Dong-a Ilbo, and JoongAng Ilbo — for attacking President Roh Moo-Hyun's administration inaccurately and unjustly. Round two went to the liberals when they decided to dance like a butterfly and sting like a mosquito by criticizing the "big three" dailies as far-right and expressing out-of-date views that are more reminiscent of the Cold War era. Nonetheless the conservative papers have a strong following which together hold an estimated 80 percent of the daily newspapers market nationwide. After a missed uppercut by President Rho because of his 3 billion won ($2.6 million US) lawsuit against the "big three" dailies, the Hangook Ilbo and Grand National Party lawmaker Kim Mun-Soon for allegedly defaming his family on business matters, round three went to the dailies. This was the first such lawsuit by a Korean president in history while still in office. Prime Minister Lee Hae-Chan went for a combination of hooks and body blows and in result took round four after making harsh statements while talking to reporters. "I may be able to pardon the military regimes of Chun Doo-Hwan and Roh Tae-Woo, but I can't pardon the ongoing treason against the history by the Chosun and Dong-a," Lee told reporters over a few drinks. Round five and possibly the deciding round went to the Uri Party for their press reform bill. The announcement provoked heated debates on whether the papers have gone to far past the freedoms of the press and free market principles or whether the ruling party is. A single newspaper company could not hold more than a 30 percent market share. The three largest dailies together could hold have a market share of over 60 percent. 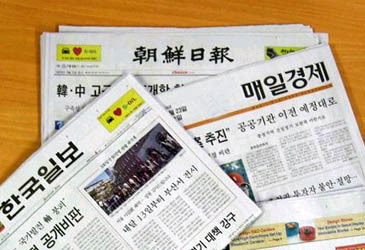 Papers can only fill up 50 percent of their space with advertisement, anything more and they would be faced with up to 20 million won in fines. All newspaper companies will have to submit their financial statements, operations and audit reports, and information on circulation, subscriptions, advertising and ownership structure to the Ministry of Culture and Tourism. Newspapers are required to establish a committee to protect the rights of readers. Grants more power to Internet media publications. Even though the fight isn't over, the papers still have a lot of power on their side. The question now is will the papers be like Muhammad Ali when he beat George Foreman in the "Rumble in the Jungle" or will they go down like any of the nameless fighters who fought Mike Tyson before he went to prison.